This blog post is sponsored by EcoScraps. All opinions are my own. Growing up, my dad always had a huge garden and I loved having fresh produce. There is nothing like going to your backyard and picking ingredients for dinner that night! When Troy and I got married, we started our own garden right away. We lived in a mobile home and had a huge lot and had the biggest garden. The problem is that the soil was very sandy so most things did not grow very well. Since we moved to our new house in 2012, we have had quite a small garden but luckily, the soil is awesome and our garden has been very plentiful. We plant 6 tomato plants, 1-2 pepper plants, some lettuce and spinach. We have switched it up a bit what we grow but that is our plan for this year. We have never had success with growing spinach so far but this year, Troy took special care when planting to make sure that they had the best sun and planted them perfectly according to directions. He even made a special tool to make sure that they were the right distance apart as well as the perfect depth in the ground. If this spinach does not come up, we are DONE growing spinach haha! In previous years, we were so blessed with excessive amounts of tomatoes. Two years ago, I made 3 gigantic batches of homemade salsa and canned it. Last year, we still had a lot of salsa left over from the year before so I made homemade pasta sauce. They both turned out great and I loved having fresh tomato products all year long. We just finished the last of our salsa from two years ago and have maybe 6-8 jars of pasta sauce left. We enjoyed throwing both of these in soups as a healthy base. This year, if our tomatoes grow well like they have in the past, I will plan on making some salsa and some pasta sauce. The key is letting it simmer as long as possible so that the water will cook off. Our salsa was a little watery but by the next year, I learned that the sauce needed to be cooked longer. I am partnering with EcoScraps which is a company that sells a variety of soils, plant food and liquid fertilizers. The products are made from food that was being wasted and clogging up landfills and hurting the air that we breathe and is turned into products that can benefit us. In the US, 40% of food is being wasted. Ecoscraps recycles these food scraps into lawn and garden products that can be used. They have recycled 75 million pounds of food waste so far over the last 4 years and plan to recycle that much just this year. I love it! Their mission is perfect: grow gardens, not landfills. I got to use a variety of EcoScraps products for our garden this year. I picked them up at my local Walmart. I chose three different kinds of products to try: EcoScraps Natural and Organic Tomato, Herb and Vegetable Plant Food, Moist Garden Soil and Rose and Flower. We plant flowers in our front yard (starting last year) and love being able to give the soil a boost. As you can see, Adalyn helped with the whole planting process. I was so proud of her. 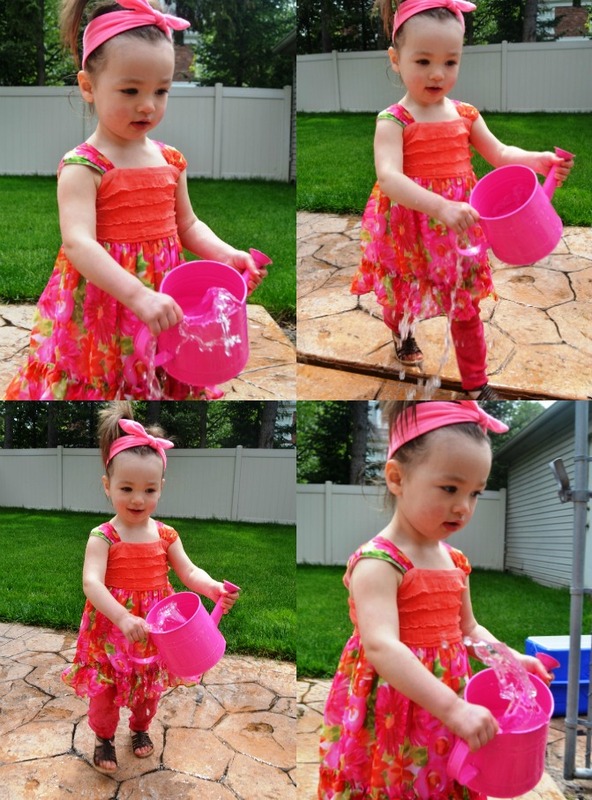 She watered all of the plants (look at the water flying in the collage of pictures- lol). She sprinkled the Tomato, Herb and Vegetable Plant Food (and then we washed her hands right away). When these pictures were taken, we were waiting to plant because there was a cold day coming a few days later so we just took care of the plants outside until then and then brought them in for a day. We then planted them which went well. We used the EcoScraps soil then. There is nothing like a garden fresh tomato so I will do whatever it takes to have awesome tomatoes in the garden. My little buddy helped me plant which was very fun for her first time gardening. The plant food for the tomatoes has added calcium to prevent blossom-end rot on tomatoes, peppers and squash which has happened to us before. The EcoScraps garden soil is made from fruits and vegetables and can be used for all kinds of plants and gardening. We added this to our soil for a boost of nutritous soil to help our plants. Check out this YouTube video to see why EcoScraps is awesome! Good luck to all you gardeners this year! Hope it is a plentiful year. The giveaway will be for a $50 Walmart gift certificate to one reader! I would love to win so I can buy gardening supplies for the summer. I buy all of my gardening supplies and plants at Walmart so I would love to win this! I would like to purchase some Walmart produce and ice cream. I'd love to win this for my wonderful friend who goes to Walmart all the time for her vegetable garden supplies. Last year she sent me home grown tomatoes, sauce, salsa, and the best pickles, from her own cucumbers. I want to win so I can start a garden in my backyard. I would use it to donate to charities. I'd love to win and I'd use it to get the items I need to start my Vegetable garden. I would love to win to purchase garden supplies. I would use the gift card to purchase Ecoscraps to try on our garden! Thanks for the great informative post! I love to garden and can always use supplies so I would love to win. I want to win so I can buy more gardening supplies! I want to win because I would love to buy this potting soil and other supplies to plant an herb garden. I would love to win so I can work on sprucing up my garden area. I would love to win so I can get more perennials for the garden. I would love to have things com back! I wanna win so I can get more essentials for the garden. I would love to win so I can expand my garden this year. I would love to win because....winning is FUN! Would love to win so we can work on our garden! WE have had some bad storms lately and I don't know if my garden will need to be redone. I would like to win because I need to buy so many things for my garden and flower beds. I'd like to win for buying groceries. I want to win so that I can buy more groceries. Thanks for the giveaway! I would love to win because my garden needs a facelift. I want to win so I can spend that walmart card on my pets. I would love to win and add some more vegetables to my garden. I got it started late this year. I would love to win this to buy a few of the Ecoscraps products for my garden.They sound like great products. I would love to win this to buy supplies for our garden. I would love to win this Walmart GC to buy supplies for my garden. I would love to win so that I can buy decorations for my wedding! i would like to win to get some seeds for my garden.